The quiet whir of 50 electronic ‘thaumatropes’ makes a gentle wind-in-the-trees background noise for the duration of my visit to In the Fields studio in their flat, (open to the public as part of the 2006 Edinburgh Art Festival). A formation of discs—printed with black branch sections on one side and red blossom on the other—spin in unison, creating the illusion of a plum bough in full bloom. They are powered by a solar panel suspended from the window: the supply is intermittent, affected by each passing cloud and burst of sunshine. Inspired by a Japanese haiku that describes plum-blossom as indicating the arrival of spring, the work illustrates In the Fields use of technology to interpret poetic aspects within systems of nature. They try to use technology in experimental and creative ways; to change the computer interface from keyboard and mouse to something more imaginative and responsive. In the Fields is a partnership between Stefan Baumberger and Nicole Heidtke, who have combined their practices in an apparently natural pooling of skills and ideas. They met while studying and teaching respectively at the Bauhaus University in Weimar, which reopened ten years ago under ambitious principles, similar to those of the original Bauhaus school; integrated teaching and learning between art, new media, architecture and engineering studies. This approach is clearly evident in the practice of Baumberger and Heidtke, who collaborate with others and search out technology to realise their ideas. 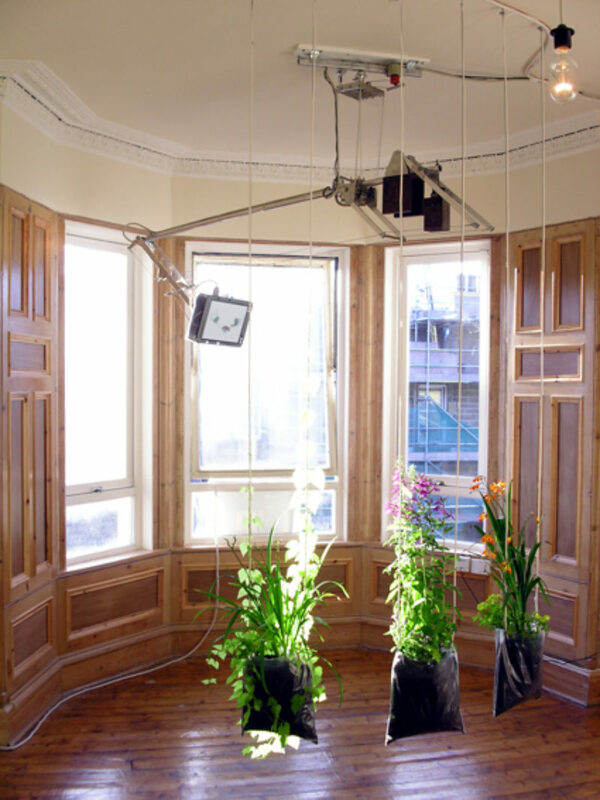 An earlier work, ‘Ima Flue’ (by Stefan Baumberger with five other named collaborators), features a large robotic arm hovering over three bags of soil and flowers, suspended from the ceiling. At the end of the arm is a monitor showing a three-dimensional animation of the wing movements of a hummingbird—the whole of this swoops down to the bags whenever they are touched. The action imitates and reverses nature, and the subtle interactions at play. In stark contrast to the flourishing blossoms and tendrils creeping up the suspension wires, the exceptionally unnatural environment is unavoidably clinical. In its original incarnation, it was even programmed as a self-sufficient environment, with built-in watering systems and light regulators. Installed in the ballroom of a castle in Germany, overlooking the landscaped gardens, it encouraged comparisons with the natural and man-made environments all around us. With new work underway on swarm formations—a hot subject in the mathematical world—In the Fields promise to try and match their interests in science and nature; to reduce them to those intangible ‘essence s’ that celebrate beauty and wonder in a technological world.